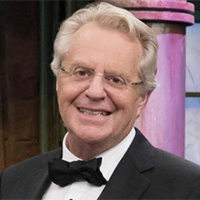 The former host of The Jerry Springer Show is expected to return to daytime TV next fall for a courtroom show that handles small-claims cases, according to The New York Post. NBCUniversal is producing the series that will feature the 74-year-old Springer, a former attorney who graduated from Northwestern University's law school, in a black robe behind a desk. The Post reports Judge Jerry is "expected to incorporate some elements of his notoriously rowdy current program, including a raucous, fist-pumping studio audience breaking into chants of 'Jerry! Jerry! Jerry!' and Springer ending the show with his signature line, 'Take care of yourself, and each other. '” The Jerry Springer Show was canceled earlier this year, ending its 27-year run in July.